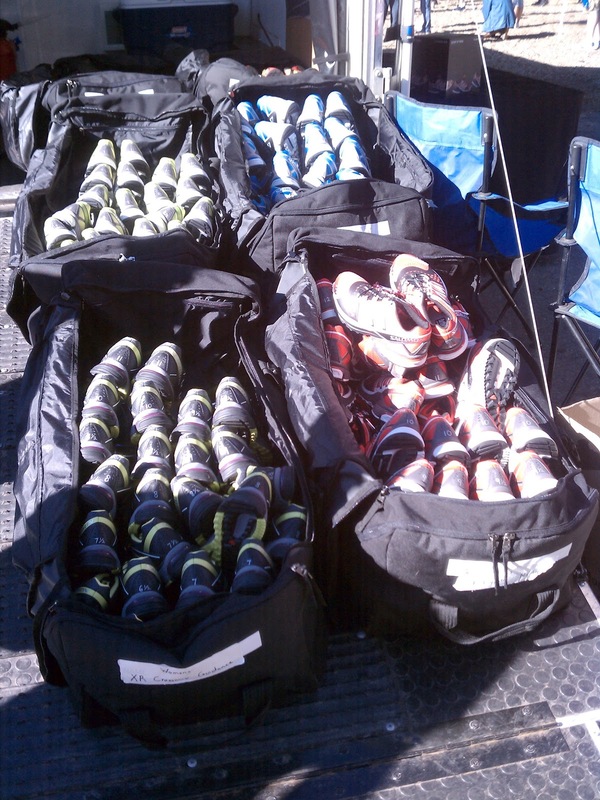 They had a few different models - the Crossmax XRs, which I have a pair of, the Speedcross 3, a new version of the Speedcross 2, which I also have a pair of, and an aggressive new shoe called the Fellcross. 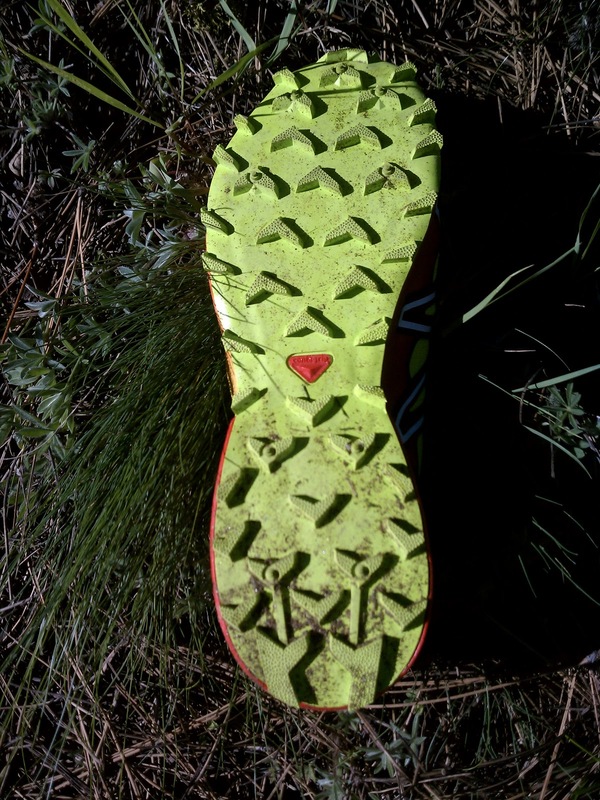 I wasn't into trying a pair out that morning -I had my MT101s all laced up and ready - but despite the colors, I was intrigued by the looks of the Speedcross 3. A few weeks later, at the Truckee Running Festival half marathon, I was able to demo them during the race. 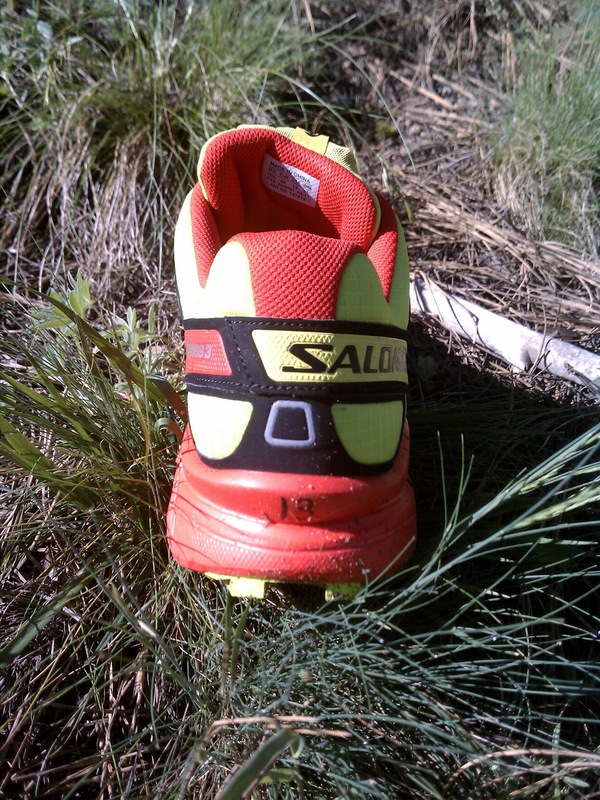 In chatting with the Salomon rep as I slipped a pair on, I learned that the changes from the Speedcross 2 to the 3 were minimal but important. Basically, he said, they lightened it, lowered it, and widened it. As that's what I've been looking for in a shoe lately, I was excited to run in them. 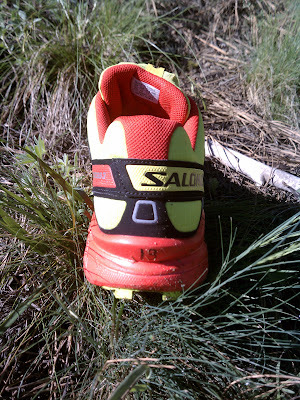 The fit was, right off the bat, everything I've come to expect from a Salomon - perfect fit from the start. The course that day turned about to be perfect to test these shoes. There was some dirt road, a bit of pavement, some easy trail mileage as well as some very technical, rocky singletrack. The Speedcross 3s held up to all of it wonderfully. On anything covered with dirt, these shoes felt perfect. The aggressive tread plowed through the sandy stuff we had in some of the early miles. I know from my Speedcross 2s that this tread pattern will shed mud, too - not that we had any that day. Once we started the serious trails, climbing and descending, I could tell that the shoes had been lowered - they felt much closer to the more minimal models I've been running in recently. Weirdly, it was on the sections of pavement that I was most impressed with how these worked. The fact that they were lower definitely contributed, but I think some subtle changes to the tread pattern at the heel helped as well. 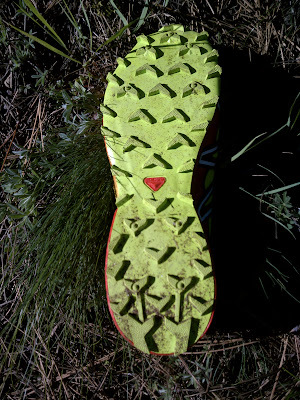 My Speedcross 2's felt - well, kind of "tippy" any time I had to run on pavement. The 3s had none of that instability at all. Very good changes made there. As far as the shoe feeling wider, I didn't really notice - but maybe that's just because I'm more used to a little more foot splay from my recent footwear choices. Honestly, the only thing that would stop me from buying a pair of these is the color choice. That neon is a little too much for me - I prefer a more "stealth" look to my shoes. So, way to go, Salomon. That's the way to update a shoe - keep everything that worked, change the couple things that didn't, and maybe lighten it up a bit. 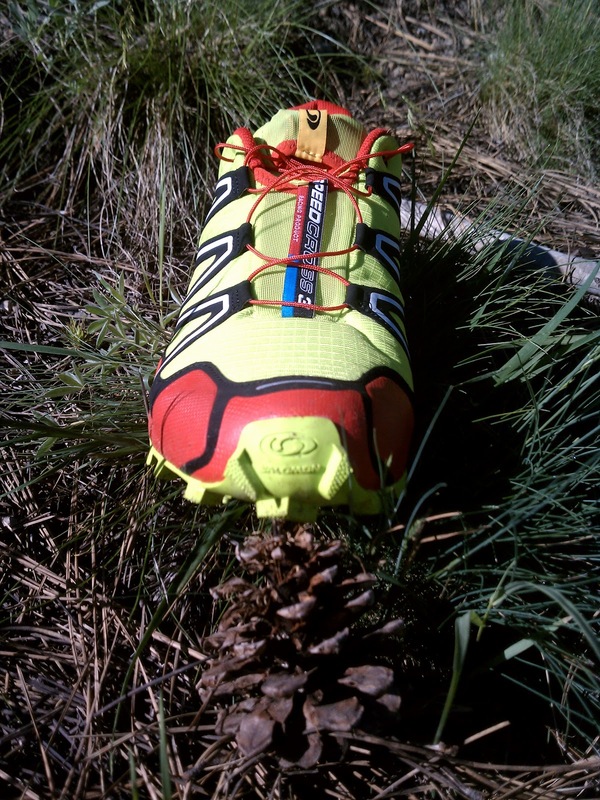 My new Speedcross 3 held very well in the recent Mt Kinabalu mountain race in Malaysia. It is indeed wider than my same-size Speedcross 2 which now feels smaller since my feet seem to have grown coz of a high mileage 2010. The 3 feel more stable as well. 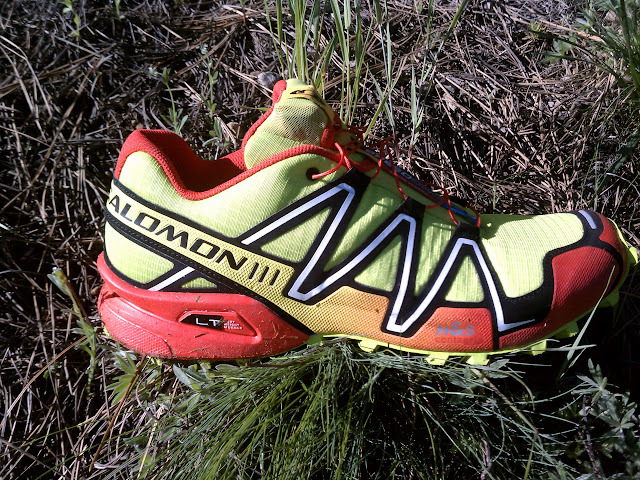 It is my preferred shoes for the trails...performs even better than my pricier S-Lab 3.